I’m writing today to let you know that we are officially launching our Optimize Coach certification program. We’ve had a lot of people ask for this over the years and nearly launched it last year after 700+ people expressed interest but it wasn’t quite the right time. I’ve decided that NOW is the time and that our Optimize Coach program has the potential to be a catalytic force multiplier to help us truly change the world. As such, the program will be a focal point of my work/life/Optimize in 2019 as we launch our inaugural program and certify our first class of Optimize Coaches. Here are some high-level details and an invitation to be among the very first to sign up and become an Optimize Coach. Optimize Coach: Who’s It For? 1. Masters. Individuals who want to live their most heroic lives by mastering themselves and the Optimize perspective while integrating the wisdom gained from the program into their various leadership roles—from entrepreneurs, CEOs, venture capitalists, military leaders and HR executives to therapists, school principals, yoga teachers, and world-class moms. 2. Coaches. Individuals who want to live their most heroic lives by mastering themselves and the Optimize perspective while integrating the wisdom gained from the program into their new or existing coaching practice. Our program will serve both of those groups. From my perspective, the most important thing we’ll help everyone do to boost their professional success—whether that’s the CEO or the Coach—is to become a radiant Optimizing exemplar. And… For those individuals looking to create a coaching business (and/or to take their practice to the next level), we’ll have a bonus Coaching Business track in which we’ll share best practices and offer additional resources including interactive sessions with established, successful coaches. Optimize Coach: Who’s It NOT For? Registration for the Optimize Coach-I program closes on Jan 30th. So, if you’re feeling it, let’s do this! NOTE: The first 101 people who sign up will have a chance to win a free 1-on-1 session with me. Note: An important part of our Optimize Coach program will be raising our standards in all aspects of our lives and stepping up to our heroic potential. A big part of that will be truly mastering our Big 3 framework in which we forge new Identities and become our optimus best with our Energy, Work and Love. A big part of that will be stepping up and into an “Athlētē” persona. Of course, that will mean different things for each of us, given whatever personal limitations we may have. But, we’re ALL doing a Spartan Race together as part of our graduation. Even if you’re in a wheelchair, those of us who aren’t will get you through the course and bang out your burpees for you. You at your Energy best? You’re an Athlete. Period. Fun: We’ll see if we can get Joe De Sena (Founder and CEO of Spartan Race) to Coach us a bit. The program will, of course, be grounded in our Optimize content: +1s, PhilosophersNotes and Optimal Living 101 master classes. Throw in some Weekly Training Sessions and some daily #carpediem posts on our social platform (more on that soon) and we have a solid curriculum of Optimizing that operationalizes areté by integrating the best of ancient wisdom + modern science + practical tools to help you become the best, most heroic version of yourself. As important as the Optimize content will be, the focal point of the program will be OPERATIONALIZING all the wisdom into consistent, virtuous behavior—such that your prior best becomes your new baseline. THAT is the hard part. THAT is what we are committed to helping you (and your clients/colleagues/family/etc.) truly MASTER as a result of your participation in our program. And THAT is what will be required in order for you to successfully graduate. Check out the full program overview below. Navy SEALs go through their training with a swim buddy. (And then they have a swim buddy throughout their SEAL careers.) Although we’ll spare you the Hell Week, I’m inspired by both the astonishingly high standards of SEAL training and the importance of having a swim buddy. As such, we will pair you up with an Optimizing Buddy. Basic idea: You and your Optimizing Buddy will hold each other accountable to your Optimus selves and refuse to accept failure. Note1: If you do the program with a friend, you’ll get 10% off and we’ll pair you up with your friend. (My Optimize Buddy? Alexandra.
) (Actually, Alexandra and I will each have another Optimizing Buddy: Emerson. He’s going to be our youngest Coach-in-Training and will be rocking the curriculum as part of his Optimize Schooling. Note2: We’ll see if we can get my friend Mark Divine, former SEAL Commander and author of The Way of the SEAL and Unbeatable Mind to join us to share his wisdom during one of our weekly calls. Hooyah! As we’ve discussed, wisdom is only part of the equation. Community is, arguably, even more important. As such, the Optimize social platform will be a very important part of our Optimize Coach program. And YOU, as an Optimize Coach, will be an integral part of our community—front and center as we strive to help 100 million people Optimize their lives so we can change the world together. (The first class of Optimize Coaches might get extra-special love. There will be a number of ways we’ll leverage the social tools as part of our program. More on all that soon. We’re pricing it at a deliberately super (!) low price point because a) We’re committed to giving the best to the most for the least and b) You’ll be part of our very first certification class (yes, there will be dust as we build this out! lol) and we want to absolutely astonish you as we make this unquestionably the best investment you’ve ever made in yourself. More details coming soon, and you can check out our FAQs about the program here. But, if you know you’re ready, you can sign up today. As you know, Optimize is my life’s work. And this Optimize Coach program is one of my top priorities for 2019. I commit to giving you my absolute best to a) help you make 2019 the absolute greatest year of your life while b) helping you become the most heroic version of yourself so you can most powerfully help others become the most heroic versions of themselves so c) we all have the strength to change the world together. I’m honored that you’re even contemplating the opportunity to join our Optimize Coach program. P.S. Of course, if you have any questions, please just let us know. You can reply to this email or send an email to [email protected]. P.P.S. So… We announced the launch of Optimize Coach at noon on New Year’s Eve. In a little over 50 hours we had over 250 awesome Optimizers sign up. (And, given my obsession with 4.5 hours of Deep Work for Peak greatness combined with my love of all things 101, I took it as a wonderful wink from the Universe that the first 101 Coaches signed up in almost exactly 4.5 hours. I (and we) couldn’t be more inspired, humbled and committed to absolutely astonishing you with awesome. We thought we’d cap our inaugural class at 300 (yes, another wink to our Spartan Hērōs). We’re going to keep our Optimize Coach – Class I open for registration beyond the first 300. (I was thinking I’d like to help empower 1,000 Optimize Coaches this year (via Class I that starts in February and Class II that starts in July) and now I’m thinking, why not just release the brakes and let the energy flow? In fact, Michael Balchan (my right-hand guy in helping us launch Optimize Coach), and his wife Kristen are doing it together as well. 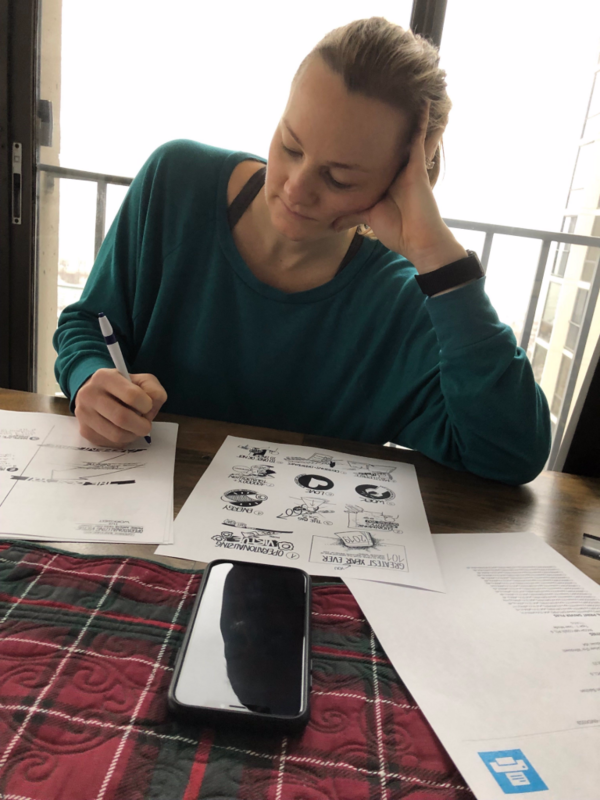 (He sent me a pic of Kristen working through the Greatest Year Ever journal on New Year’s morning on their coffee date and my heart just melted. See below. It’s funny how many people who have no intention of becoming an actual “Coach” are signing up. And… While we’re at… Here’s Michael’s journaling of his #carpediem virtues. Yes, he writes backwards Da Vinci style just for fun. #thatslikehim! We have two primary targets with the Optimize Coach certification program (aka Project: Operationalize Virtue). First and foremost, we are committed to helping you Optimize YOUR life so you can be a radiant exemplar as you give your gifts to the world. With a solid foundation of demonstrated mastery of our own process of Optimizing, we’re ready to (and worthy to!) Coach. We will provide a systematic framework and Optimize Coach methodology to help you coach others to be their Optimus best selves. To support these two primary intentions, we’re planning to segment our program into two phases. Phase I will be focused on Coaching ourselves. Phase II will be focused on Coaching others. Here’s a quick look at our current plans on the high-level programming for Phase I.
Note1: This will all evolve. Note2: This content will (of course) be supplemented with the Community support—starting with the Optimize Swim Buddy with whom every Coach will be paired plus the online noble social Optimize platform for us to connect and support one another in an environment in which the optimal behavior is the normative behavior plus the offline Optimize Local initiative where we can all actually meet in real life. Note3: One of the things I’m most excited about is to create a program that is not only grounded in science but VALIDATED by science. In other words, I want the DATA that proves the efficacy of our work together and with our Coaching clients—which is why I’m really excited to be working with Sonja Lyubomirsky and one of her top Ph.D. students from their Wellbeing Lab to help us scientifically validate the efficacy of our Optimize approach. Imagine being able to point your prospective clients to data (from our pool of prior Optimize Coach clients) that shows a measurable uptick in well-being (eudaimonia!! happy souls!!) as a direct result of their work with us (correlated to their engagement with our core Optimize practices). (Basically, quantifying comments like this.) Then welcoming your new clients with an Optimize intake form on Day 0 then tracking their Optimization over the subsequent weeks as you work together—empirically demonstrating their improvements. Again, fired up to share more soon. For now, as promised, let’s take a quick look at the Overview for Phase I. We will begin Phase I with 5 Core Intro Modules that will form the foundation of our program. Then we will proceed to the 11 Core Virtue Modules. In parallel, we will also invite a select group of world-class teachers to join us for Luminary Sessions while we continue working on additional Essential Practice Modules. In which we hang out with Aristotle and Martin Seligman, discover that the word “psychology” literally means “the study of the soul” and commit to studying what a “good soul” (aka eudaimonia) looks like and, most importantly, figure out to how to master the process of high-fiving our inner souls all day every day by operationalizing virtue as we move from theory to practice. Enter: Eudaimon-ology. In which we begin architecting our Masterpiece Days driven by our Optimized Identities and packed with the Virtues and Behaviors that will help our souls shine. We will start with our AM and PM bookends as we systematically create the structures that will make it really hard to have a really bad day and, stated positively, considerably (!) easier to consistently (!) have great days. Enter: Higher highs and higher lows and the confidence to know what to do to make Today awesome #carpediem style. In which we get deeper clarity on the fundamentals: Eating, Moving and Sleeping plus Breathing and Focusing while identifying your #1 self-care habit that keeps you plugged in. We’ll make a 100% ALL IN commitment to installing the habits that will let your soul shine with radiant enthusiasm as you get in the best health and of your life. In which we learn how to install and delete algorithms (aka habits!) that will make it easy for you to show up as your best self. We need to get really good at using our finite willpower wisely to install great habits that run on autopilot so we can give the world all we’ve got. We’ll master this process as we create our first set of algorithms and start thinking about our Top 10 Power Algorithms we want running the show. We have 11 Virtues that form the core of our program (and make a cameo on our Optimize medallion and in our Optimize meditation). We will spend a session focused on operationalizing each of our core virtues. With that Wisdom, we know the importance of living with Virtue. Enter, our Optimize philosophy in one word: ARETE. The word directly translates as “virtue” or “excellence” but has a deeper meaning—something closer to expressing the best version of ourselves moment to moment to moment. We’ll talk about how to more consistently close the gap between what we’re capable of being in any given moment and who we’re actually being. Living with areté is, ultimately, how we high five our inner souls and experience the eudaimonia that the ancient philosophers and modern scientists promise as a by-product of our commitment to excellence. With the Wisdom and commitment to Areté, it’s time to get our minds right. We’ll capture the essence of this virtue with the deepest meaning of the word CONFIDENCE: to have intense trust in ourselves. In this Module we’ll discuss the importance of having antifragile response-ability to whatever life throws at us. We’ll connect that to ancient Stoicism and to the modern science of hope, grit and optimism as we explore practical ways to operationalize this virtue. With our minds strong, we get more clear on our PURPOSE—remembering that we’re committed to something bigger than ourselves as we cultivate heroic strength for two. We’ll revisit our Big 3 and explore our Soul Goals with a little more detail as we get even more clarity on who we are and what we’re here to do. That requires SELF-AWARENESS. As the Temple of Delphi (and Socrates and all wise people ever) put it: Know Thyself. From the big-picture purpose stuff: Who are you? What are you here to do? to the more mundane but equally powerful masterpiece day stuff: What habits are working? What needs work? Etc Etc. With that wisdom, virtue, confidence, purpose, and self-awareness, we’re ready for specific goals that are worthy of us. Enter: TELOS. Note: This will be for the big goals AND for the (very) next micro-moment. We need targets. Moment to moment to moment we will live with clear intention. We’ll discuss the science of setting goals and making our dreams a reality (what works and what doesn’t) while racking up micro-wins all day every day. Of course, we’ll each have our own set of physical potentialities (and limitations) but if we have a hard time getting out of (the real or metaphorical) bed because of poor lifestyle choices, we’re going to have a hard time actualizing our potential in service to the world. Enter: ENERGY and our commitment to the basic fundamentals of eating, moving, sleeping, etc. We’ll revisit those fundamentals and shine a spotlight on how we can move from theory to practice. With our energy Optimized, we’re ready to focus on what’s most important right now. Enter our next virtue: PRESENCE. I used to call this “Action” but I realized that didn’t properly account for the importance of being Present to whatever is most important right now—whether that’s Deep Work or Deep (mom/dad/friend/kid/colleague) Love or Deep Energy workouts. Etc. All require Presence. We’ll talk about what gets in the way of showing up powerfully as we cultivate focused intentionality on (echo!) what’s most (!) important right NOW! With all those Virtues working for us, it’s time for the virtue that vitalizes all the others: COURAGE. Recall that this is Aristotle’s #1 virtue—the one he focuses on first to help us become eudaimons. It’s from the Latin word that means heart and we’ll be cultivating it to do hard things as we remember our hero mantras: “OMMS! !” and “Bring it on!” We’ll talk about the importance of embracing the science of courage: seeing life’s (inevitable!!) obstacles as CHALLENGES rather than as threats. All of that is meaningless without LOVE—the ultimate source of heroic power. From Love 0.0 through 1.0, 2.0 and 3.0, we will cultivate our Love for ourselves, our intimate family and friends, those we meet throughout the day and our world. And all of that brings us to the final Virtue: EN*THEOS. We are officially connected to the Divine within. We are high-fiving our inner daimons as we live in integrity with our highest values and our best (Optimus!) selves. How’s that feel? Amazing. We are alive with an effervescent, radiant enthusiasm as we give our gifts most fully to our families, communities and world. … If you feel so inspired, pause for a moment and feel the power of the ripples we can create in the world as each of us does the (often hard!) work to operationalize these virtues. Note: We have nearly 1,000 Optimize Coaches in Class I. Imagine what we can do together. Now… Fast-forward x years. Imagine what 100,000 Optimize Coaches can do. We can, quite literally, change the world. We will invite some of the world’s leading teachers, scientists and peak performance experts to help us apply their wisdom to our lives and to our Coaching practices. In addition to creating 101 master classes with us for our Optimizers, they will spend some time with our Optimize Coaches to help us go deeper. Phil Stutz and Barry Michels wrote The Tools and Coming Alive. They have been coaching elite performers for decades and will join us to teach us to apply their wisdom to our lives and Coaching practices. Michael Erwin is the CEO of the Character & Leadership Center and founder and president of the Positivity Project. He has taught leadership at West Point and will be sharing key leadership principles from his book Lead Yourself First. Guess who else is officially confirmed to join us? Joe De Sena, Founder and CEO of Spartan Race (and author of Spartan Up!, Spartan Fit!, and The Spartan Way will be helping us get our minds (#OMMS!!) and bodies ready for our graduation Race. AROO! !